We have been a little shuttle crazy around here. We love talking with you about your favorites and sharing ours. (We aren't supposed to pick favorites though.) Now that you have a beautiful boat shuttle, it is time to wind that bobbin. What is the best way to do that? The key to winding a bobbin is to bring the yarn on as tightly and evenly as possible. Loosely-wound bobbins can cause the yarn to catch on itself causing the shuttle to jerk. This can wreck havoc on your selvages. Next to a loom and shuttle, the weaver's third best friend is her or his bobbin winder. There are three basic types, single-end manual, double-end manual, and electric. Single-end bobbin winders can accommodate most popular bobbins, pirns, and spools. There are also thinner shaft styles available that can handle smaller paper quills. They are the most affordable style of bobbin winder ergo the most popular. 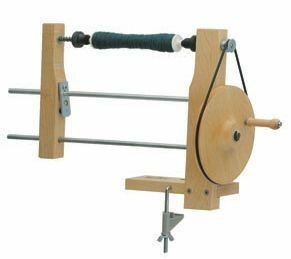 A similar style winder is the double-end manual bobbin winder. It puts tension on both ends of bobbin, pirn, or spool. This gives you more control and keeps the bobbin (or pirn or spool) from slipping, which is very annoying when you are trying to wind a nice, even, tightly-wound bobbin. Now we get to the mother of all bobbin winders—the electric. Electric winders are available in single or double end. It is going to give you the fastest results and also frees up a hand so you don't feel like you are patting your head and rubbing your tummy. Having the right tool for the job makes our crafting life oh, so much better!